Home > Seafood Appetizers > Awesome Shrimp! > Large Shrimp Cocktail! Shrimp Cocktail, A Party Favorite Everyone Enjoys! These are our large shrimp which are peeled, cooked and ready to eat when you get them! 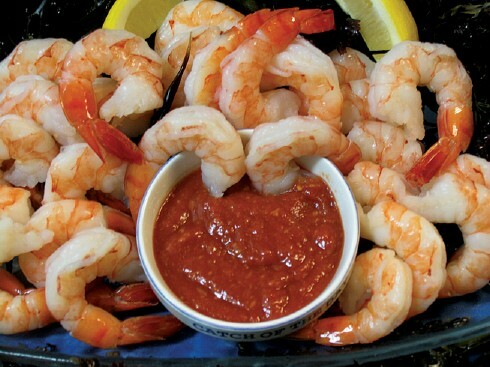 These Shrimp Make A Great Appetizer! Shrimp are fully cooked, peeled, and deveined; ready to eat! Large Shrimp! • Jumbo Shrimp! • Captain Tim's Awesome Cocktail Sauce • Baked Stuffed Jumbo Shrimp! Our Shrimp Cocktail Makes A Great Appetizer! Your Shrimp Arrive Cooked And Ready To Enjoy! Don't Forget To Order Capt. Tim's Cocktail Sauce To Go With Them! Order these Awesome Cocktail Shrimp By 10am EST, And Enjoy Them For Dinner Tomorrow! Shrimp Cocktail Also Make A Great Gift Idea For Your Favorite Seafood Lover! How Easy Is That!